Genetic crops design company Evogene Ltd. and biotechnology firm Rahan Meristem Ltd. announced positive results in developing strains resistant to a widespread Banana fungus. 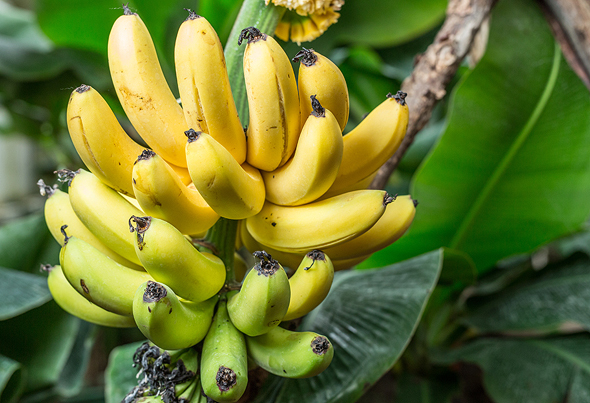 The companies’ second-year field trials with specialized banana strains have shown effectiveness against the Black Sigatoka fungus, the companies announced Tuesday. The joined trials make use of genome editing technology—targeted modifications in a cell’s DNA—for the purpose of developing a potentially safer and healthier product for both growers and consumers. The Black Sigatoka fungus imposes substantial costs on global banana producers, surpassing $500 million per year, according to a study published in the journal PLOS Genetics on August 2016. Chemical fungicides are currently considered the only effective treatment, but are regarded as polluting and their frequent use increases the likelihood that fungicide-resistant strains will evolve. Founded in 2002 in Rehovot, 12 miles (20 km) south of Tel Aviv, Evogene used its predictive computational biology platform to identify banana genes predicted to be highly resistant to the fungus. Exporting millions of plants each year globally, Rahan Meristem, established in 1998 and headquartered in Rosh Hanikra, near Israel’s northern border, specializes in cell biology and genetic engineering. The end product is targeted to be classified as non-GMO, significantly lowering regulatory hurdles. The partnership between the two companies “will bring new value to the entire chain of production,” said Rahan Meristem CEO Ron Diner, in a press release.